On the very first morning of my holiday, after checking out Maruyama Koen and Heian Shrine, I headed for Ichizawa Hanpu on Higashioji-dori. Ichizawa Hanpu is a renowned purveyor of handmade canvas bags which I first heard about via this Japundit article. As per my comment on that page, I decided to head to this store to buy a good, rugged tourist's bag which would also make me cool in the eyes of the locals. I arrived at the store at 9:45 on Monday morning and joined the line of at least 60 people already waiting (no surprise, I was the only foreigner). 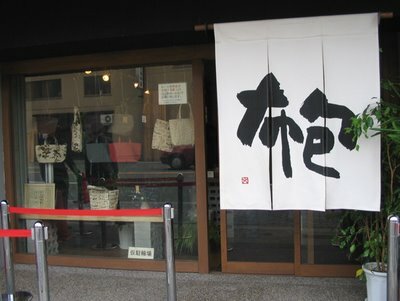 I got the feeling that a trip to Ichizawa is a must-do for any one-day visitor to Kyoto since a lot of the other people waiting were looking at maps and guidebooks to the city. When the doors opened at 10 am, more than 100 eager shoppers were in the line that snaked down the alley beside the store. Only a few people were allowed into the shop at a time, so there was more standing around to do. 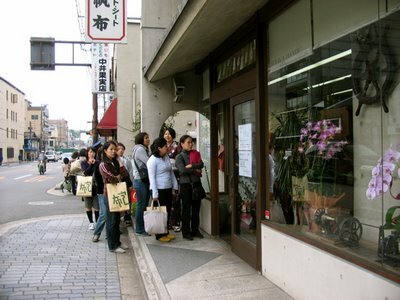 But waiting in line to go into a store is a very Japanese thing so I was quite content to take part in this cultural experience. At one point, a man in an apron, wooden sandals and a barcode hairstyle came out of the store and bowed to each of us waiting in line, thanking us for our custom and apologizing for the wait. When my turn to shop came, I found that the tiny, basic store had very few items for sale. What was available was only as many bags as had been sewn in the previous few days. 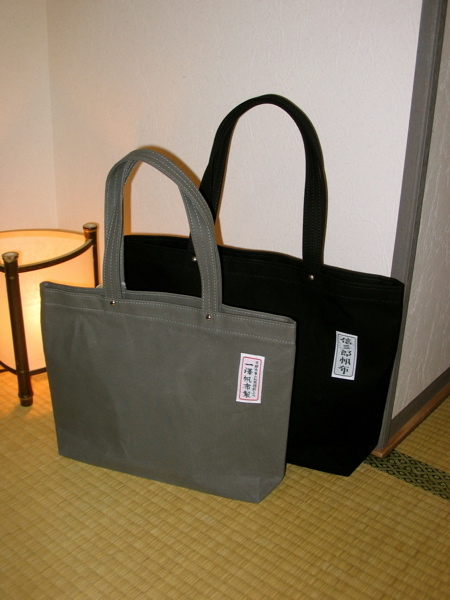 The bags are of dense canvas in muted colours like beige, grey, black, green and faded red. The forms are very straightforward: squares or rectangles with simple patch pockets. Metal rivets strengthen the wide, double stitched straps. I had been wanting a large black tote, but none were left (I should have lined up at 9am), so I settled on a small grey purse. One helpful store clerk decided to practice his English and told me that I "had better buy the bag" (common ESL error) since this store was the only place in the world that sold them. I would soon discover that this was not the case, but I bought the bag anyway. 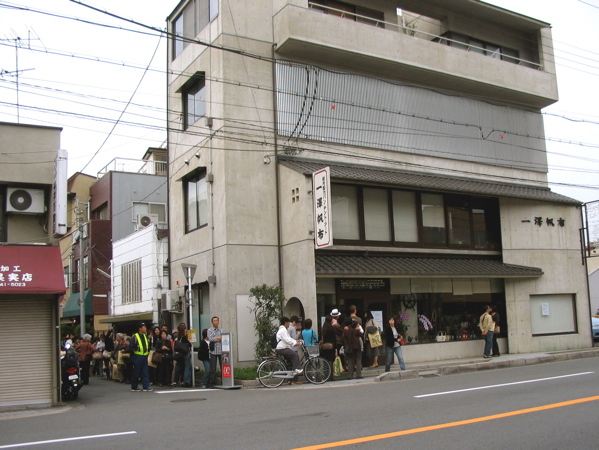 While biding my time waiting in the line, I had noticed another line forming across the street and I realized that it was for Ichizawa Hanpu's new rival, Shinzaburo Hanpu. The story goes that Shinzaburo was started by one of the brothers from the original store's family (more detail in that Japundit article). 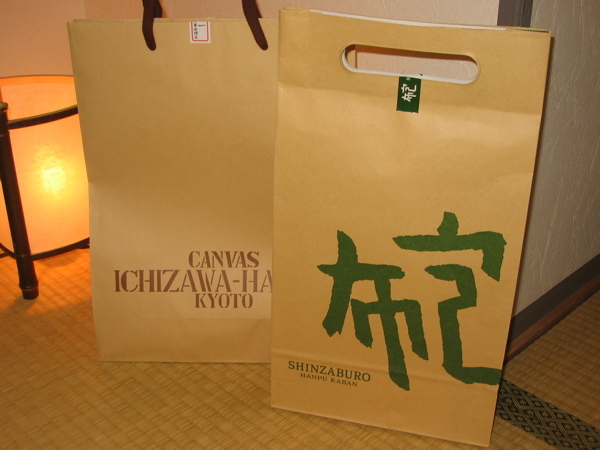 The Shinzaburo store is within sight of Ichizawa and sells identical products at the same prices, although some bags are available in patterned canvas, too. It seems that for now, Ichizawa and Shinzaburo are sharing the market quite well. All the shoppers (me included) crossed the street to line-up for the other tiny wood-floored store after finishing up at the first. I found my black tote at Shinzaburo since the patterned bags were selling faster there. I've had time to put these two bags to good use by now and I have to admit they are wonderful. Plus, as predicted, I got some major reactions from Japanese friends and new acquaintances when they spotted what was slung over my shoulder. Everyone wants to know if I know "the story" of the brothers and the rival stores. You've got to love a conversation starter that also carries your daily necessities so nicely, right? Check out this more in-depth New York Times write-up for more on Ichizawa Hanpu. i wish men had more to rut about with than their ipods, cellphones, and plasma TV's. i love those bags! any idea if they sell over the internet? they look like PERFECT teacher bags! Wonderful story! 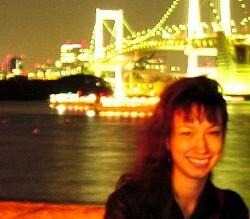 I'm so glad to see all the photos, and I'm really envious you got to go to the shop across the street. And I'm really glad that you got so many comments from the Japanese--isn't it bizarre how something that simple is such a cultural trigger? Anyway, I'm sorry to take so long to write my comment. But I am very glad that you seem to have had a good time.